Are you an ambitious final year business, accounting or finance student looking for an exciting career in accountancy? Application for our 2019 Graduate programme is now open. Our summer Internship programme is aimed at students about to commence their final year of study giving consideration to a career in Finance. Internships exist in all our departments. Accounting by its very nature is very broad, one thing I really enjoy about working in Baker Tilly Hughes Blake is working across the various departments and getting exposure to different elements of accounting. Each day is varied, and I am constantly learning. Working at Baker Tilly Hughes Blake has opened many doors for me. From day one we are taught to develop in a learning and supportive environment, while working collaboratively with Managers, Directors and Partners. The work life balance is great and everybody is really supportive of trainees and are always happy to offer a lending hand, no job is too big or too small. It really is a great place to work. 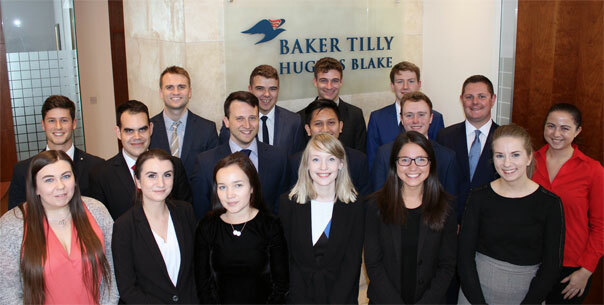 Working as a trainee in Baker Tilly Hughes Blake’s audit department is great in many different ways. There is a nice balance, between your work life, study life and your personal life. It also has an amazing environment to have the opportunity to work and study and often feels like being part of a big family as the team around me are so helpful and co-operative.